Advert for 1931 Gulbransen radio available in NZ. The year 1931 was a highlight year for early radio broadcasting in New Zealand. Less than a decade after new broadcasting rules were introduced in 1923, New Zealanders had enthusiastically built private radio stations throughout the country and a fledgling government national service was serving the four main metropolitan centers. Before tuning along the radio dial of that year, it's worth briefly looking at the stations that were broadcasting in the decade beforehand. Some of these callsigns will be familiar to many older New Zealanders, such as 1YA and 2YA. It may be surprising to know that 1YA used to be a commercial station, and that the original 2YA was in Nelson, not Wellington. 1ZR Auckland, detail from Lewis Eady letterhead. These were not the only stations with regular programs. Amateur radio operators such as 2AZ Taihape also broadcast entertainment programs. Other stations like 3AQ Christchurch also came on the air and left. The Radio Broadcasting Company of NZ was established as a national operation in 1925 only after an earlier plan by the NZ Co-Operative Dairy Company [now Fonterra] to operate a station from Hamilton to serve dairy farmers was rejected. Over the six following years, more commercially owned and radio society stations came on air, and 1931 emerged as a high point in the country's early radio broadcasting history. It was short-lived. 1ZH Hamilton detail from letterhead. By later that year, the Napier earthquake had knocked several stations off air. Disagreements over record royalties soon shut down several more stations. More dangerously, the government wanted a stronger national service. The 'trade' or commercially owned stations soon lost permission to accept sponsorship revenue. 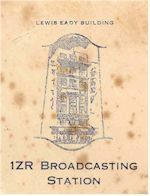 2ZW Wellington, listener card from the 'Voice of the Capital'. Within a short period, the Government would effectively force the nationalization or close down of all but two private stations and introduce its own National Commercial Broadcasting Service with 1ZB. Listeners used large wooden radio sets, with glowing valves inside, and connected to outside wire aerials to tune along the dial in 1931. At night, stations from Australia, Hawaii, California and even Asia could be easily heard because there were so few local stations to listen to, and stations such as 2FC Sydney, KFI Los Angeles and KGU Honolulu were very popular. 4ZP Invercargill sent this hand drawn card to listeners. As you can see, in some cities, several stations even shared time [ST] on the same frequency, on air at different times and on different days. Imagine how confusing it was for listeners in Dunedin who could leave their radio dial on 1080 and hear four separate stations with different programs. Some large cites such as Wellington and Christchurch only had two radio stations. Not much choice there! 3ZE Greymouth issued this card to confirm reception. A note on the back apologizes for operating 10kc off frequency! 3YA Christchurch, detailed card signed by AR Harris of the Radio Broadcasting Company in 1928. © Noel Brown Collection in September 2006 issue of "Tune In" Radio Bulletin of the NZ DX Radio Association. Companies involved with selling radio equipment owned many of these first private stations called 'trade' stations. In some cases, these had grown out of musical instrument and sheet music stores. Overseas radio manufacturers often supported these local businesses. In other cases, enthusiastic local people were the inspiration behind the stations, and in 1931, most New Zealanders enjoyed a good variety of radio stations. David Ricquish outside old 3YA Christchurch studios in 2005. 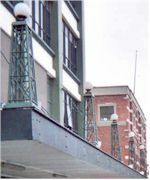 Note the set of bronze radio towers still used for outside decorative lighting. What kind of radio sets did people use to listen to these stations? What kinds of programs were popular? Who were the personalities of early radio? Who were early radio amateurs? What memories do early radio pioneers and listeners have about this period? Why did the government want to control all radio broadcasting? What other radio stations could New Zealanders listen to? This is an introductory article in a new series Celebrating Over 75 Years of Popular Kiwi Radio. Other articles scheduled in this ongoing series will begin to answer some of these questions and cover other radio broadcasting eras right up to contemporary New Zealand today. If you or your family have memories of any of these stations, images, memorabilia, booklets, photos, old recordings, magazine or newspaper clippings, old advertisements or anything else, please contact us today. It's important to make sure they're not lost or destroyed or the memories forgotten. We have a safe home for New Zealand's radio heritage.